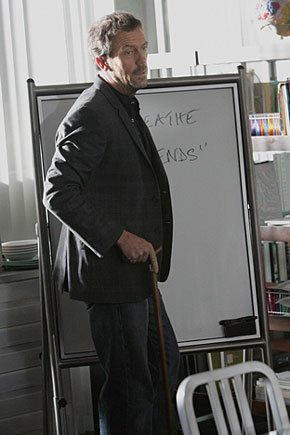 House (Hugh Laurie) and his White Board. We had something up first at house-guide.com and then at housemd-guide.com about six weeks later but it wasn't until Friday, May 13, 2005 that we felt there was enough on each of 47 first pages to go start asking for links back from other websites and to announce the site in one forum (televisionwithoutpity.com). On July 15, 2006 the site was 250 pages. This website is the work of many people. Many sections will be done by individual contributors — see their by-lines — and other contributions will also be acknowledged here (for instance when someone finds a typo or mistake in the site, we offer gold stars). House and his favorite soap "General Hospital", which connects the two seemingly very different television shows. The Character of Dr. Cameron which asks, does this team of writers have particular trouble making Cameron consistent? Doctor James Wilson: A closer look at the charming Dr Wilson; cook, "boy wonder oncologist" and serial womanizer...? House MD Beyond the Script: The music and what it means and the various meanings of the titles of the episodes. Performance Reviews: Which of the team made the final diagnosis and who added to it with their suggestions or discoveries along the way. House, MD's Title Connections: Where are the House, MD titles headed, what they refer to in the episodes, how they relate to the staff and patients of PPTH, and perhaps how they link the themes and characters to the outside world. The above is right around when "Need to Know" was shown. 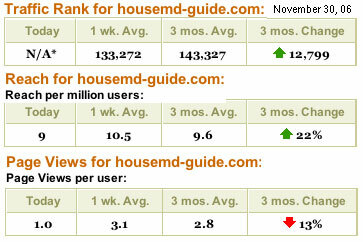 See the beginning ratings and search positions for this site.